Remember last week’s AV Club contest puzzle? My brain tends to be primed for puzzles like this from all of the other puzzle hunt style stuff I do, so from the title, I had a hunch that I needed to keep the second square of each entry blank wherever possible. This led to some fun additions as squares eventually got filled in – 25A‘s PRATES becomes PIRATES in the final grid, 34A‘s SUSS becomes SEUSS, and what may be my favorite, 58A‘s BY GEORGE (“Exclamation upon tasting a jolly perfect Sunday roast”) ends up as BOY GEORGE. Hopefully you didn’t want to hurt Jeff Chen by the time you finished the puzzle. Once the grid is filled in from the clues, there’s still 7 blank squares that need filling. These only resolve one way for all the available crossings to still make words, in a phrase that feels appropriate for this puzzle’s fill: ON A DIET. So, I dug this puzzle from beginning to end. It’s the kind of thing I love to see the AV Club do, and that I don’t think you’d see in any major outlet, at least not as the day’s main puzzle. It’s cool to see constructors playing with the form to see what all they can do with some black and white squares like this. This entry was posted in Contests and tagged Jeff Chen. Bookmark the permalink. I had a real hard time getting started, especially when I thought ‘SNAP’ was correct where ‘POP’ was a fit. Eventually it came to me, and then I thoroughly enjoyed it! Ditto – slow start, and then a nice workout figuring out (and admiring) how it all went together. Loved it! I’m not trying to be contrarian, because the creativity and construction really were amazing, but I had reservations about a couple of things. First, I didn’t like that SEP was clued as 51-Down and then appeared elsewhere in the finished grid. That seems like a duplication even though it may not be one in a technical sense. Second, I don’t like that the circled letters were used in a proper name like PAAR. I don’t generally like it when crosswords get too insider-y, and it’s totally crossword insider knowledge that PAAR is a valid letter combination. If PAAR is fine, why not ISLE/ASO? Why not SHEP/SHAG? Could also be SKEP/SKAG, now that you mention it (though I doubt those are the first pair of words anyone would choose for that crossing). But of course we know the circled letters spell a message, and that checks them, so that eliminates SHEP/SHAG as a possibility. Also Jack PAAR is a rather famous person, crossword-friendliness notwithstanding. The ‘T’ square from ON A DIET could also be an ‘H’ and make the legitimate words SHAG and SHEP (as in the name). Also, 51-down and 44-down are kind of, sort of dupes of each other. If you accept OTTS (as in “Former Giants Mel and his kin”), then both of these problems would be simultaneously fixable by making 51-down STET. Granted, that’s some crappy fill, but the ease of the fix leads me to believe that there are other ways to fix that corner that remove both the ambiguity and the dupe. I just loved this puzzle so, so much. I solved the puzzle legitimately, and then realized you could just choose “reveal solution” on the .puz and read the circled letters. Probably should have been encrypted (like MGWCC puzzles) or left out the circles (which I think would still be fair and gettable). What am I missing? I have no clue as to what’s going on. The answer for each clue of the puzzle has one fewer letters than there are squares for it in the grid (for example, 58A’s answer is BY GEORGE, 8 letters long, while the grid has 9 squares). Following the title of the puzzle, you skip the second square and fill in the rest. Doing this for 49D, LONI, you fill in the second square, turning 58A in the grid to BOY GEORGE. Doing this through the rest of the puzzle leaves you with just the circled squares left over. There’s only one combination of letters that allows you to fill these squares in with valid crossword entries AND form a phrase appropriate to the puzzle – ON A DIET. Love your pizza, by the way! I got the no-second-letter part of the gimmick. Now, explain to me how the final fill BYGEORGE or L[E]ONI fits into the scheme of things. I can find no relationship to either the clues or the one-letter-short fills they add to. They seem to be terms that have come out of thin air with no connections to the puzzle, at all. it would have been easier to construct this puzzle so that any old letter could have filled each second square, resulting in a gibberish grid. the elegance of this puzzle is that each fully completed entry is a valid crossword word. Way too much work to solve this which…I didn’t. Not only did I say to myself (as Papa John did), “What am I missing?,” but I said the same thing after reading the supposed explanation of the puzzle by Ben Smith. I’d hoped for a clear explanation of what was going on with Jeff’s puzzle. Ben’s original write-up didn’t come close to providing that. His reply to Papa John below does a better job but a clearer explanation from the beginning would have been more helpful. I really liked solving it, until what I thought was the very end, and Across Lite did NOT tell me I was done. I therefore had to wonder if that was because (a) I got some letter wrong somewhere, or (b) I had to fill in SOMETHING in the holes that it seemed to me should be left blank, or (c) there is a bug in Across Lite which makes it unable to tell you that you’re done if there are intentional blanks. After much wasted time spent looking for an actual error, I eventually decided, well, maybe it really does want me to fill in something in these squares that really seem like they should be blank. And voila, an underwhelming, disappointing, seemingly arbitrary end to what otherwise had been a great puzzle. The relation between (say) “BYGEORGE” and “BOYGEORGE” is merely that the “O” is a real part of the crossing clue. It is the second letter of the horizontal clue, and so should be ignored in the horizontal clue, but it is NOT the second letter of the vertical clue, and so it should be paid attention to in the vertical clue. 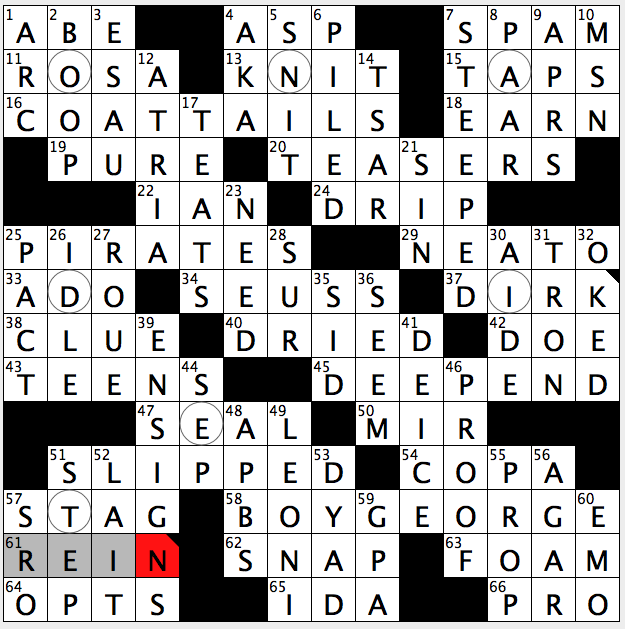 The holes are all at the boxes that are simultaneously the second letter of the horizontal clue AND the second letter of the vertical clue, so they are ignored in BOTH. But every box other than those holes is a “not-the-second-letter” of SOME clue, so it is “real” in at least one (and maybe both) clues. A couple of observations that, while minor, made for an annoying solve. 11A: I spent 8 months in South Africa and it was always referred to as RSA. This puzzle is the first time I have seen the letter “O” used. So logic dictates this country is USOA for crossword purposes, correct? 65A: James T. Kirk was born in Riverside, Iowa, according to the fiction. Who in hell abbreviates Iowa as IDA? I know constructors grant themselves broad license but a little editing and fact checking goes a long way. Obviously the crossnerds are aswoon over this one, but it doesn’t rise to a five-star difficulty IMHO, otherwise I could not have finished. You’re correct on both of these, Armagh! 11A is RSA (entered into the grid skipping the second square) and 65A is IA (again, entered skipping the second square – the title “No Seconds for Me, Thanks” points to this). The O and D come from the entries that cross these answers (DAD, in the case of 65A) to create another set of words that are crossword-friendly, R[O]SA and I[D]A.
the O in what becomes ROSA is slightly tricky since it’s one of the letters you have to figure out after the rest of the grid is filled in. You missed the point of those answers. The answer for 11A appears as ROSA, but it’s to be interpreted as RSA because you skip the second letter. Same thing for 65A: It looks like IDA when you fill it in, but you interpret as IA. You’re supposed to skip the second letter of ALL the grid entries for the clues to make sense. But if you skipped the second letter of ALL the grid entries, you wouldn’t have room for the first T of CATTTAILS and the Y of BYGEORGE. I’m not sure if there are other entries that also wouldn’t have fit. I’m not sure if I’m missing something, but having a couple of entries that require filling in the second letter to make sense seems inconsistent to me. Otherwise, it’s an impressive puzzle. you only skip the second square of whatever clue you’re on. all of the “empty” second squares except the circled ones are filled in by the crosses. the circled squares are second squares in both across and down clues, so they won’t be filled in by any clues. Doh! Thanks for explaining that, austin. I take back what I said about inconsistency. Now I think it’s a *very* impressive puzzle. Been waiting for an explanation of this puzzle since it left me utterly thwarted last week — if it wasn’t for the comments above I’d still be waiting. That’s the least illuminating crossword review I can remember reading, and I read a lot of them. Sorry to disappoint you, Sam! This was about as tricky to write up as it was to solve. 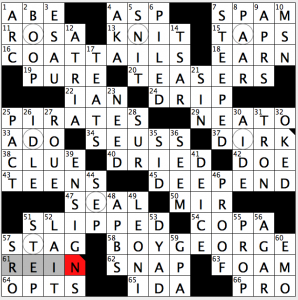 This puzzle perfectly captures everything I dislike about gimmicky/themed/meta crossword puzzles. Just give me big, hard themeless grids with no jokes or gimmicks or meta nonsense and I’m happy.